What does sculpture look like today? The three-dimensional art form has certainly come a long way since the marble busts and butts of yore. 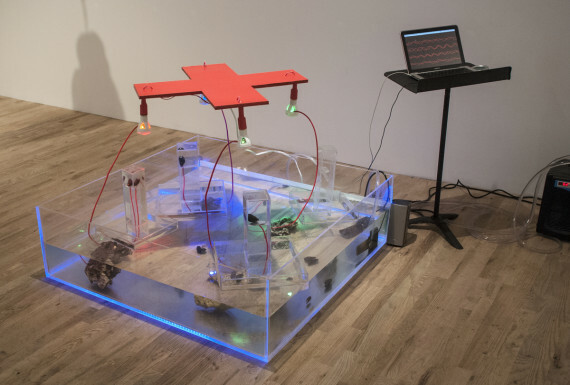 A new exhibition at Postmasters in New York, titled "This Is Sculpture," is exploring the many manifestations of sculpture as it exists in the contemporary art landscape. Although the point isn't emphasized by the gallery, all the contributing artists are women. "I think there is an over-privileging of painting happening all over the place and sculpture seems to be a little secondary," Postmasters owner and curator Magdalena Sawon told The Huffington Post. Some of the medium's recent negation, in conversation and in the art market, stems from the predominance of transforming artworks into pixels to be shown on the web. While paintings and photographs can be translated into net-friendly forms easily, digitally rendered sculptures accentuate their distance from the IRL original. Yet, as Postmasters reminds us, sculpture's domain extends beyond the small corner of a gallery in which it dwells. "Sculpture exists in and defines not just physical space, but psychic space, conceptual space, political space. And not just space, but our presence in it, our relationship to it, our movement through it, our responsibility for it." Sawon, along with curators Paulina Bebecka and Tamas Banovich, crafts a stunning survey of strange and surprising large-scale sculptural forms, each revealing that sculpture is far more than the physical thing itself. The all-female nature of the exhibition flies as an under-the-radar feminist win for a medium that's long been associated with "macho scale" artists like Richard Serra and James Turrell. "We really wanted to talk about the medium, and viewers are free to make the connection that the market that privileges painting over sculpture also privileges male artists over female artists," Sawon explained. "We tried to go against the gender cliche where Richard Serra makes massive sculptures and women make these cute little things." The artists on display are of the most ambitious variety, each occupying a different vision of what sculpture can be. 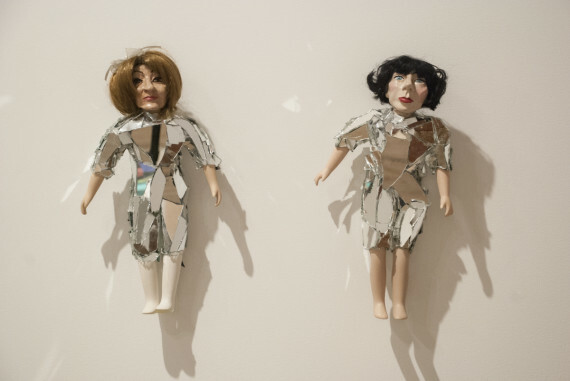 All of the sculptures are large in scale, excluding Rachel Mason's "Starseeds," doll-sized replicas of her female heroes from Bjork to Ana Mendieta to Amy Sedaris, all donning disco ball-esque garb. Seven of such dolls are sprinkled around the gallery in which Sawon calls "a little thread that goes through the whole show." Other notable works include Natalie Jeremijenko's "MUSCLExCHOIR," which is literally a choir of mussels (yes, the saltwater mollusca). Jeremijenko treats salinated water to become the perfect ecological system for mussels to live. "They are hooked up to electronic transmitters and when they open and close that movement is translated into light and sound. It's a really amazing," Sawon explained. "I wouldn't go as far as to say mussels make exciting music but it's really fascinating." Caitlin Cherry's "Mute City, Big Blue, Port Town," features a repurposed large-scale painting serving a rather unorthodox purpose, as the floor of a swimming pool. The 87 by 79.5-inch pool is only a foot deep -- "You can sit around it, you can't really dive in" -- offering a refreshingly strange way to view the relationship between painting and sculpture. The 16 sculptors on display offer a dizzying rebuke to the dominant market trends in terms of both artistic medium and artist gender. We can't quite phrase it better than Sawon herself: "Women can do it with equal zest, energy and variety." "This is What Sculpture Looks Like" runs until August 2 at Postmasters in New York. See the 16 female sculptors of the exhibition below. Installation shot, courtesy of Postmasters Gallery, New York.